WELCOME TO LEMC 2018 IN SKOPJE! 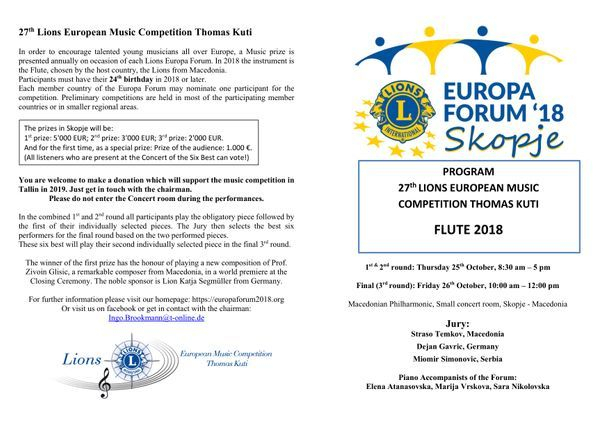 Young flutist born in 1994 or later are cordially invited to participate in the 27th Lions European Music Competition. Please liaise with the Lions organization in your own country via internet for further information and registration. Registration form you can find at the bottom of this page. For twenty-seven years the Europa Forum has already included a Music Competition. A Music competition dovetails perfectly with our Forum. It puts the principle of Lionism into practice, promoting fraternity and exchange among young people from different nationalities and cultures as well as spreading music and encouraging its practice. The competition is also a means of promoting a sense of service in the districts concerned and helps extend public awareness of Lions. The competition is named after the founder of the competition from France, Thomas Kuti. 01 Participants should be born in 1994 or later. 02 Participants should have been resident in one of the participating countries of the Europe Forum for at least five years prior to January 1st in the year of the competition. 03 "Participating countries" are countries as defined in Article III of the Europa Forum's rules of procedure. 04 No former winner of a Europa Forum's music competition may participate again. 05 Each participating country may nominate one (and only one) participant for the competition. Preliminary competitions are held in most of the participating countries on a multidistrict or district level. Detailed information about these preliminary competitions may be found on the multidistrict's or district's web sites. Do not hesitate to contact us in case of questions. 06 The participant's registration has to be submitted to the Chairmen of the Committee by June 30th in the year of the competition. 07 All costs arising from attending the competition will have to be paid by participating country. - Two pieces of their choice out of the repertoire list. Additionally, the 1st prize winner will perform the new composition for the Europa Forum as a world premiere at the Closing Ceremony. - On Wednesday, October 24th, candidates will have the chance to practise with the accompanists of the Forum. - The selected six candidates will perform their 2nd piece out of the repertoire list on Friday, October 26th, in a concert open to the public. - The Jury will select the winners as a result of both rounds. The three winners of the competition will be presented at the Closing Ceremony of the 64th Europa Forum on Saturday, October 27th. They will receive their prizes, the 1st winner will play the world premiere. The winner of the first prize has the honour of playing a new composition of Zivoin Glisic, a remarkable composer from the Macedonia, in a world premiere. The noble sponsor is Lion Katja Segmüller from Germany.